Colin’s latest paintings have all had something pretty unique about them: the pin-feather challenge was certainly the most difficult, and he has just completed a painting of a woodcock using a 150-year-old pin-feather, perhaps a record in itself. But this one really takes the biscuit in terms of size – and in the amount of blue paint required! This spectacular painting is the largest that Colin has ever attempted, on a sheet of paper one metre by two. It is a commission, and when finished it will feature three peacocks, one of them pure white. With the board initially propped on the floor, he had to sit in quite an awkward position to begin work on the top, and he is now having to stand as he works downwards and the board needs to be raised up further and further. I’m wondering if we’ll need to make a hole in the ceiling! You can see more of Colin’s latest paintings on his website. Just fabulous painting!!! Thank you for the post!! Thank you very much, Marialla! WOW this is remarkable! When I first viewed the post I thought that’s a fantastic photo of a peacock. Not till I read the post did I realize it’s a painting! Amazing!!! Thank you, David! It’s going to be a stunning picture when it’s finished. So very realistic, a rhapsody indeed! And luck with the practical arrangements ….. Thank you! Could be interesting! This is too much even for my imagination…. So complex…. I see that he uses a mahlstick ( germ. Malerstock – supporting the hand ), I also use one when I paint on my easel. That is well observed! 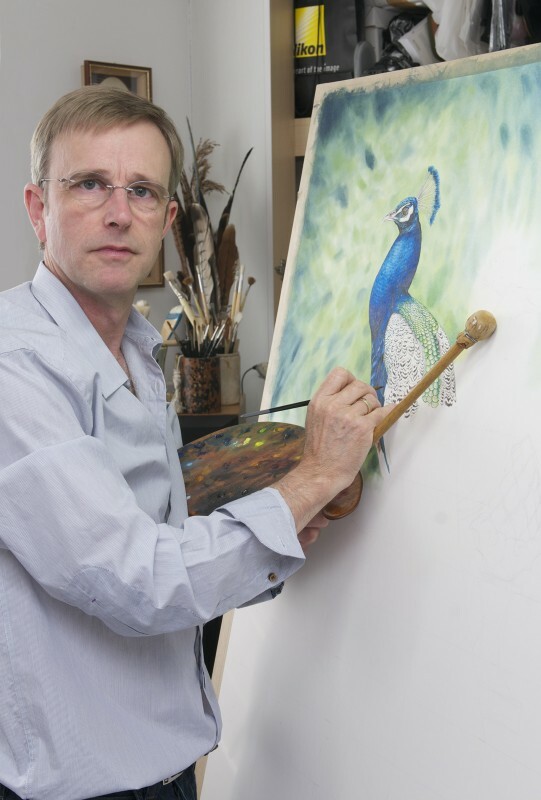 Yes, Colin has always used a mahl stick – interesting that you do too. Yes, the peacock is amazing – it’s the most ambitious thing he’s done. Thank you for the comment! Wow, that’s a beautiful portrait! I thought it was an actual photo of a peacock rather than a painting. Amazing talent! Thank you! Definitely Colin’s biggest challenge. I’ll post more pics as it progresses.